Nowadays most of us work in office buildings and the working conditions there have a strong impact on our productivity and well-being. Allowing daylight into the room and an unrestricted view to the outside will help to create a pleasant working environment. In addition, the sun entering the rooms can reduce the heating demands. Windows play therefore a key role when dealing with energy-efficient and user-friendly buildings. However, shading devices are inevitable to protect us from the glare of the sun and overheating in summer. But they are often recognized as disruptive elements. Even though standard solutions like venetian blinds can be regulated manually or automatically such devices may be sensitive to wind load and they may obstruct the outside and, last but not least, make rooms often so dark that artificial lighting is necessary. New switchable windows offer new possibilities. They can change the transparency with the flip of a switch while maintaining the vision to the outside at any time. Making them work in combination with a sensor network allows the control of daylight admission and solar heat gain without any moving parts. Costs and energy for lighting, heating and air-conditioning can be reduced in an efficient way. » Switchable Windows – How does it work? The working principle of switchable windows is based on a phenomenon called electrochromism. Materials showing this phenomenon change color reversibly when subject to an electrical voltage. A flexible and light-weight electrochromic foil, composed of several layers of different materials, is applied on the window. It can change its degree of darkness by application of an electrical voltage of a few volts. Nickel and tungsten oxide serve as active electrochromic layers. The switching is reversible and once a desired degree of darkness is achieved no electric energy is required, making the technology very energy-efficient. Switchable windows give a great vision to the outside and help save energy. Quantitative measures for possible energy savings depend on factors like: type and size of a building, its use, its location with respect to climate and surrounding, applied construction materials and last but not least the technical equipment and control of the building. The European project clear-up takes these factors into account by performing design and simulation studies for various climatic regions across Europe and different building types. The results highlight the possibilities of improvement of comfort in work envi­ronments. Next steps will be the imple­mentation in an overall simulation envi­ronment for all clear-up technologies to evaluate different combinations of clear-up’s technologies and investigate their overall potential for energy savings and work place satisfaction. Verification will be conducted with experimental tests in the laboratory and under real life condi­tions in test bed buildings and real life demonstrators². • but let solar heat enter into the rooms in winter. The temperature profile in July shows that, despite the moderate climate in a Nordic country, the indoor temperature exceeds the comfort range nearly each day during summer if no shading is applied. Overheating due to solar gains plays a very strong role. 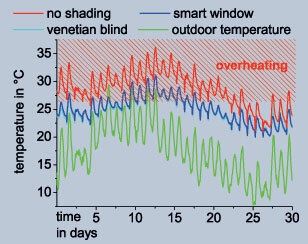 Smart windows can help: They reduce the overheating and work comparable to traditional shading with venetian blinds. At night without sun the building cools down. However, as a result of high thermal building mass and limited ventilation, indoor temperatures can not be reduced to the outdoor temperature. Looking to the performance over a whole year, thermal comfort improves strongly with smart windows. The energy saving potential by itself becomes visible when looking at the same building with air conditioning. With smart windows about 17% of total energy can be saved due to the reduced cooling load whereas the energy load due to heating stays nearly constant. 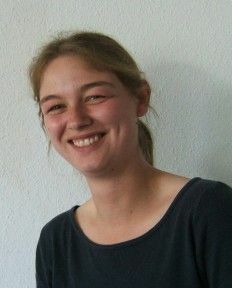 Helena Hülsey is an engineer at Fraunhofer ISE. 1 Simulations are carried out with the simulation tool TRNSYS. TRNSYS is a transient energy system simulation tool with a modular built-up that allows the users to integrate self made models with standard components that are published by the developers.